I recently tested the latest version of DreamWorld, a new OpenSim installer that lets you run your own mini-grid on a home computer. If everything goes right, installing the software, setting up a new mini grid, and loading up a pre-built region takes less than ten minutes. DreamWorld comes with ready-to-use content that you can load as OAR files. At first, being a beginner, let me say it took me a few days to complete the whole set up, due to some compatibility issues with the many machines I was trying it on. I had to contact DreamWorld developer Fred Beckhusen who was extremely helpful. In the end, I learned a lot about such software and was able to redo everything in under ten minutes. 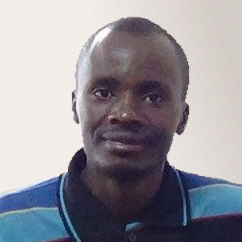 Beckhusen runs the OutWorldz grid and website and is also a software and hardware engineer and president of Mitsi, a software and technology design company. You can hypergrid and load region.oar and other files from your computer. 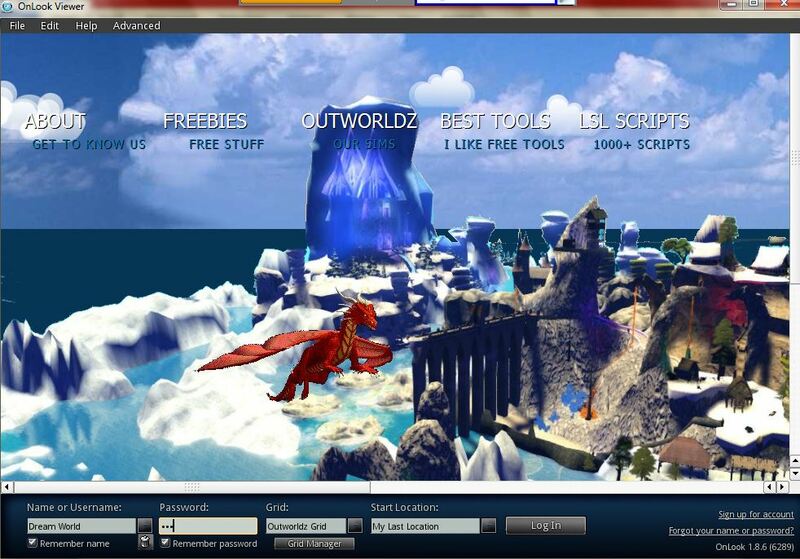 On its website, OutWorldz offers several prebuilt and ready-to-load-and-view regions. These include the Maya Pyramid, Conference Center, Universal Campus, Fantasy Island and Undersea Observatory. You can also download Linda Kellie regions from Zadaroo, where all the content is CC0 licensed for use in any whatsoever, including resale. If you download and install a region on DreamWorld and make changes, you can save the new updated OAR file to your local drive and either keep it as a backup, or distribute it, or upload it to other grids. You can save the existing content before uploading new one. DreamWorld also has hypergrid support. 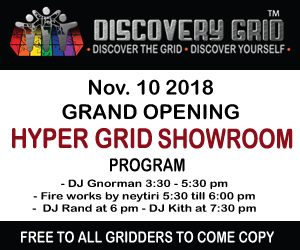 That means that you can run the grid on your home computer, log in with your viewer, then teleport to other grids. And if you have friends on other grids, they can also teleport to your grid. According to Beckhusen, 28 percent of the people who install DreamWorld have it set up so that they can hypergrid in an out. “And there have been 474 downloads,” he told Hypergrid Business. DreamWorld also has an automatic backup feature, as well as an auto-updater, an online “Help” menus and instructions. The default mini-grid is just one region, but you can add other regions as well. A typical home computer can easily support a four-region minigrid, and might also be able to stretch to nine or even 16 regions. I downloaded the installation files available on the website as a 177 MB Zip folder and so it takes quite short time to download on a fast connection. I then extracted it to a new folder on my computer, then ran the Start.exe application and gave permission for the app to make changes on my computer. Check if the user is verified. If it does not report as verified as it does on some platforms, you can choose to continue installing it anyway. It reports as unverified in some platforms. The installer works if the .NET Framework installed on the machine, otherwise it will alert you if one is needed. It will tell you which version of the .NET framework you should download and install for your machine. Clicking on “yes” takes you to the Microsoft page to download .NET Framework. If the computer reports a blocking issue after installing the .NET framework and trying to run the “Start.exe” file, head to the Microsoft page for troubleshooting. Usually, it will be a wrong .NET framework installed. In my case, I had to separately download the Microsoft .NET Framework 4.5.2 after the blocking issue was reported when I installed version 4.5. I then ran Start.exe again — and this time it worked. 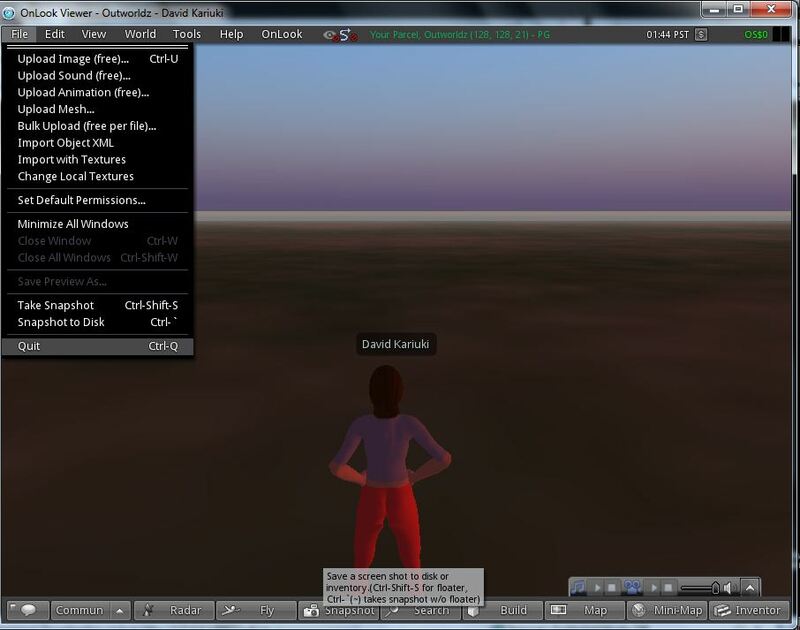 OpenSim uses a database to store all its region and user and inventory. Normally, you have to download and install the database separately, but DreamWorld takes care of all those details. 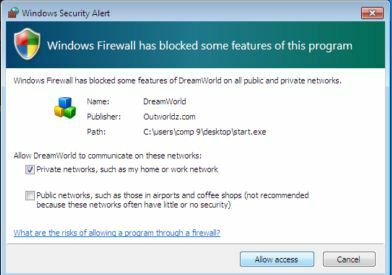 Then, a window pops up to let you open the firewall for all features of DreamWorld on both public and private networks. I simply ticked the relevant boxes on the pop up window and then clicked the “Allow Access” button. You need this if you want to be able to teleport in and out to other worlds, or to have people log into your mini-grid from the outside. Some users, such as schools, might not want to have this enabled. Firewall automatic diagnostics. Tick the two boxes. It also informed me of an available update to the installer itself. In my case, I had the 0.95 version of the software, and it asked me to upgrade to the 0.96 version. 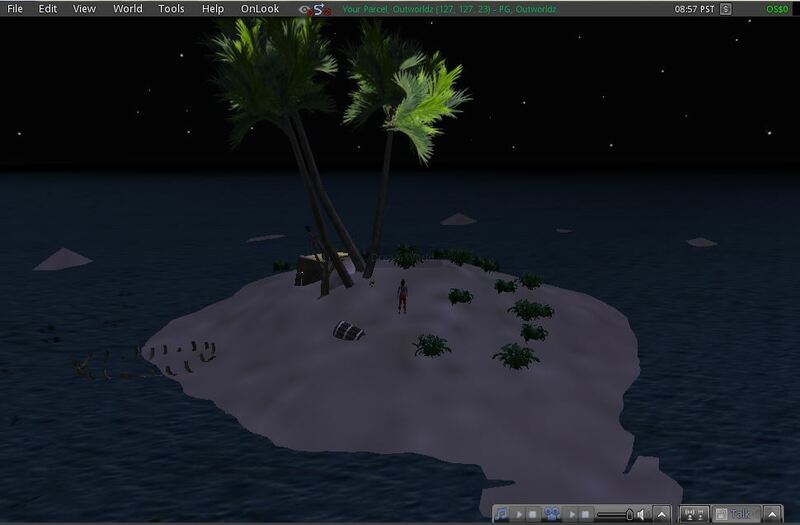 The first uses OpenSim release 0.8.2.1, which is the one used by many grid, and is a well-tested, stable release. The upgrade loads up the recently-released 0.90 version of OpenSim, which is new and a little bit more temperamental — and there are currently problems with getting DreamWorld’s hypergrid functionality to work with it. You can install or skip updates. 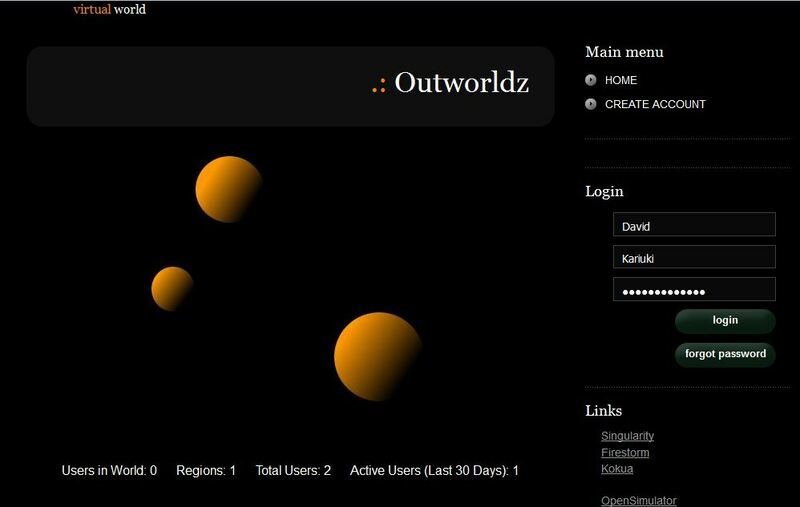 I also realized from the OutWorldz website that you can download the updater file separately at website. I tried to update but it seems that it takes a little bit long. It’s a big download, and I decided to skip it. The installer also wants to install and open the OnLook Viewer, its default viewer for OpenSim. The installer opens a new window where you have to click “install” in order to install the viewer. 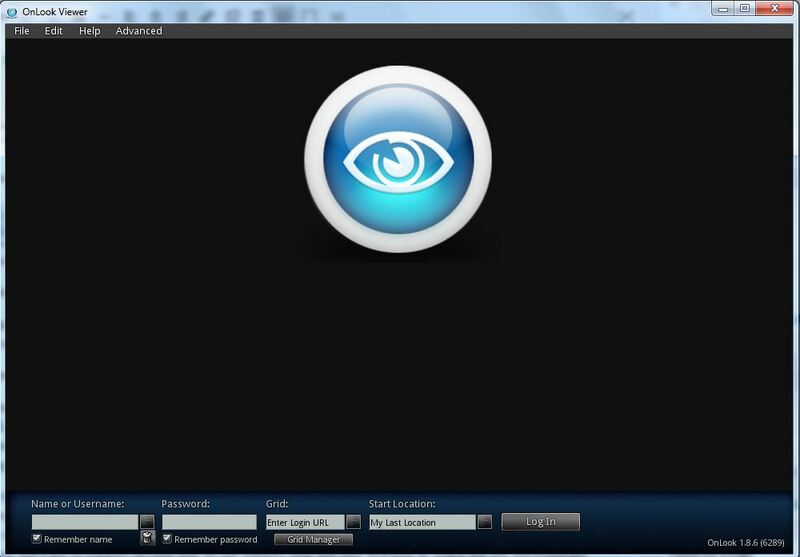 OnLook is the default viewer installed by DreamWorld. Then after installation, it will ask if you want to open. 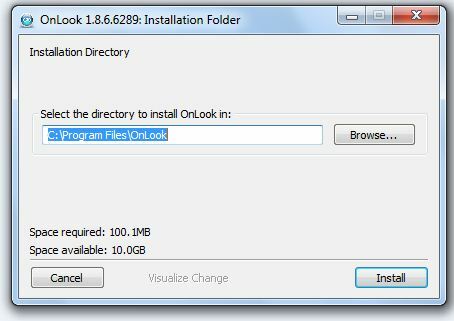 You can also find the “OnLook Viewer” file in the unzipped folder and click the “install” button to run and install it. Or you could just use whatever viewer you currently have for OpenSim, such as Firestorm. Next, DreamWorld gives you two ways to interact with your new mini-grid. You can manage it form the official OpenSim console, which you can see in the image below. The OpenSim console lets you monitor progress and do a number of changes such as editing region names. This is the most powerful way to interact with your grid, and you can do a lot of things — move regions around, load up new regions, rename regions, kick out users — all the good stuff. You can see a list of all the OpenSim console commands here. Or you can just wait just a second, and DreamWorld loads up a much more user-friendly interface. An easier interface for running your OpenSim mini-grid. This panel doesn’t do everything that the console can do, but it does a few pretty important things, including adding new regions to your minigrid, loading up OAR files, and saving region backups. You can also change the size of your regions, change the default viewers, and, if you use the OnLook viewer, you can also opt to make the user’s avatar invisible. Speaking of the OnLook viewer, DreamWorld is supposed to open the viewer automatically. That didn’t quite work out for me — I had some more issues on my computer I had to fix first, but eventually I was able to log in with the default account, using “Dream World” as the user name and “123” as the password. I could also log in with other OpenSim viewers. 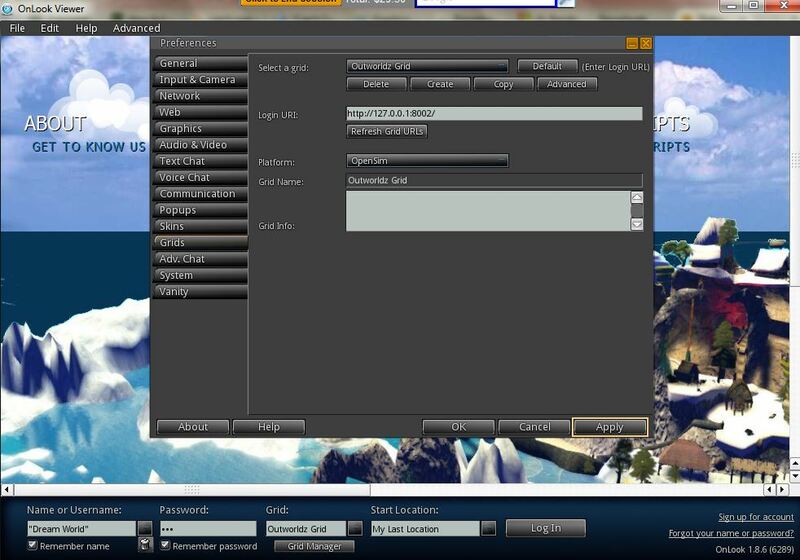 By default, you log in to the OnLook viewer with “Dream World” avatar. After logging in, you can search and teleport to other regions on the grid. Click on the “Content” menu and see the options for region files you might want to load to your mini grid. 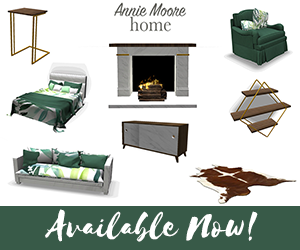 DreamWorld also creates a home page for your grid. You might recognize it as the standard Wifi page from the Diva Distro. If you have opened your firewall and allowed public access, other people will be able to get to your grid’s home page. You can also create new user accounts from this screen, or monitor your active user numbers. The region size is set to a default of 256 by 256 meters but you can also enlarge it to 512 by 512 or 1024 by 1024. This is in the “Advanced” settings in the DreamWorld management window. The “Advanced” setting allows you to set up region size, ports and region permissions. The auto back up is also in the “Advanced” settings of the viewer. The maximum period of storing the files is seven days, with older ones automatically deleted. You can also edit your details such as name, password and email from the web interface in the “Advanced” settings. The DreamWorld management panel is currently only set up to load region OAR files on the main region. Loading OARs into other regions takes a bit more work. To add OAR files, I downloaded them from the OutWorldz website and then typed the command “load oar” in the OpenSim console, then typed a space and then dragged the file onto the console and pressed “Enter.” You can see the region loaded up around you inside the viewer. According to Beckhusen, there have also been requests to attach the regions to existing grids, like OSgrid or Metropolis. Enabling hypergrid connectivity requires open ports. This is something that DreamWorld is designed to do automatically, but this feature is still under development, especially with routers that have the “loopback” issue. That results in outsiders being able to log in, but the owners themselves not being able to log in from their own computers. And sometimes the OpenSim console might fail to start due to Microsoft DLL file issues as it did in my case. 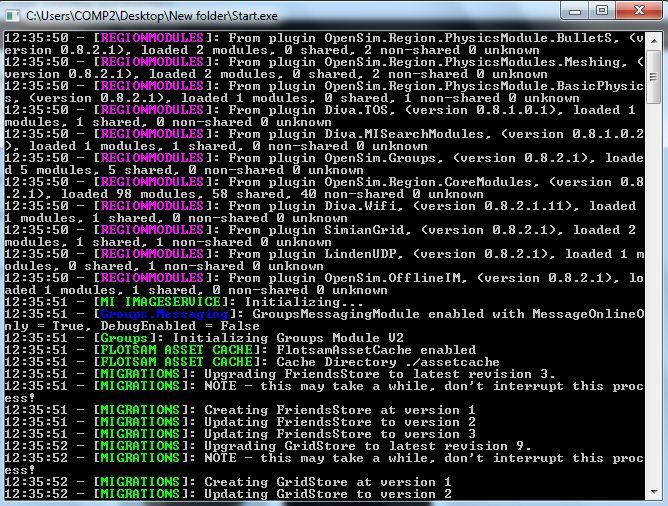 If you are running the installer from a network shared folder, OpenSim will also fail. I also had some problems at first launching the OnLook viewer, with it not opening automatically like it was supposed to. It reported that it “can’t create GL rendering content.” It turned out that the problem was with the Intel graphics on my computer. I found and downloaded new drivers, and that solved that problem. I also had problems logging in the first time out. Beckhusen told me that I had the wrong loginURI. Fixing it required that I click on the “Grid Manager” on the OnLook Viewer default window just below the password field. I set the loginURI to http://127.0.0.1:8002 as advised — and also as directed in the WiFi interface — and clicked apply, then OK.
Click the “Grid Manager” and set the right loginURI. 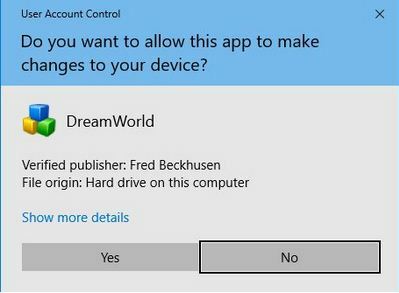 I also realized that the DreamWorld start window has advice on what to do if you are unable to login. I clicked “Help” menu and it told me how I can login. On clicking “Help”, it basically told me to visit the Wifi interface page and create a new account but obviously you only have to get the loginURI down the web interface page and set it on the viewer as mentioned above. If you are unable to login on the viewer after creating a new mini grid or editing the existing one, it says that it cannot connect to enter loginURL and that it could not resolve host. It did in my case. I solved this by checking whether the loginURI is correct and it was not. So I went again to the Wifi web interface, copied the loginURI down that page, clicked on the Grid Manger on the OnLook viewer just below the password field. 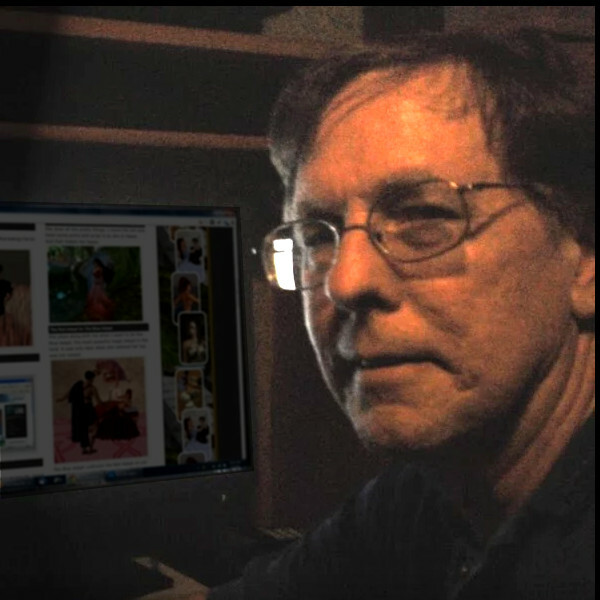 On the Grid field, I clicked “Create” then entered the loginURI copied from the web interface. I clicked “apply” and then OK and I was able to login. Check the loginURI if it reports problems of logging in after creating a new region or editing the existing one. Again, ensure that the new port is opened from the router and Windows firewall, but the installer uses Plug and Play and will configure routers automatically in most cases when you start it. However, to be automatically configured, your router must support universal plug and play mode or the mode must be enabled, otherwise you will need to open ports manually in your router to allow your personal computer to access the internet through these ports. Most modern routers support this feature. If not, you will have to locate and edit the firewall menu of your router. Here is a list of router manufacturers and how to configure the ports. The installer has options if your router does not support loopback and cannot access the hypergrid for this reason, although again, most modern routers support this feature. If it doesn’t, you can still install a special Windows device driver or an adapter to join the hypergrid in case the router does not support loopback. Type “hdwwiz.exe”on the Windows Search button and run. The wizard helps you install driver software to support devices that do not support plug and play features or which are not automatically recognized by Windows. The full instructions on how to do this are on this page. You can also get more information about routers at the OpenSimulator site. In addition to improving hypergrid support for the latest version of OpenSim, there are also other issues that Beckhusen is working on. “There will be a new release soon to fix some glitches in the OnLook viewer settings, and in some circumstances where the diagnostic sometimes fails,” he said. He will also be looking to provide more controls over common settings and is working on a number of improvements, for instance, to allow Sim-On-A-Stick users to merge or combine their older databases. He will also add more help information on the website to help broaden DreamWorld’s reach. 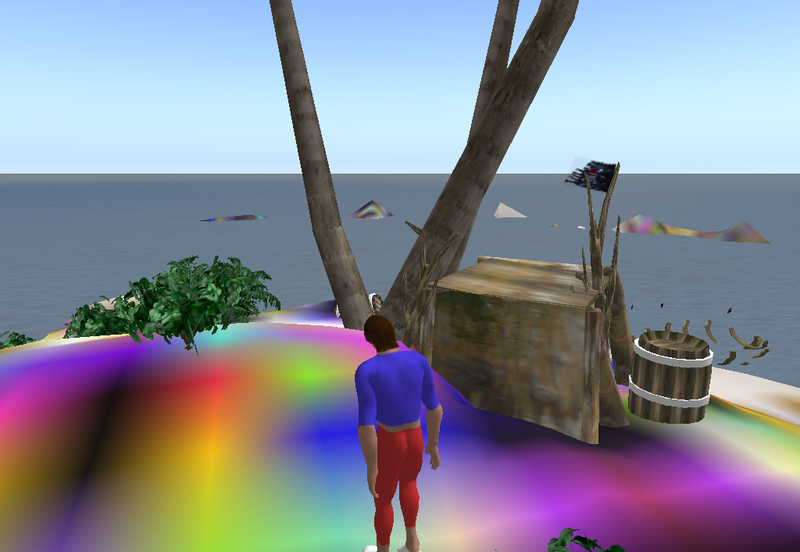 “This should appeal to educators, Second Life refugees, as well as experienced OpenSimmers who are looking for less lag and more freedom,” said Beckhusen. 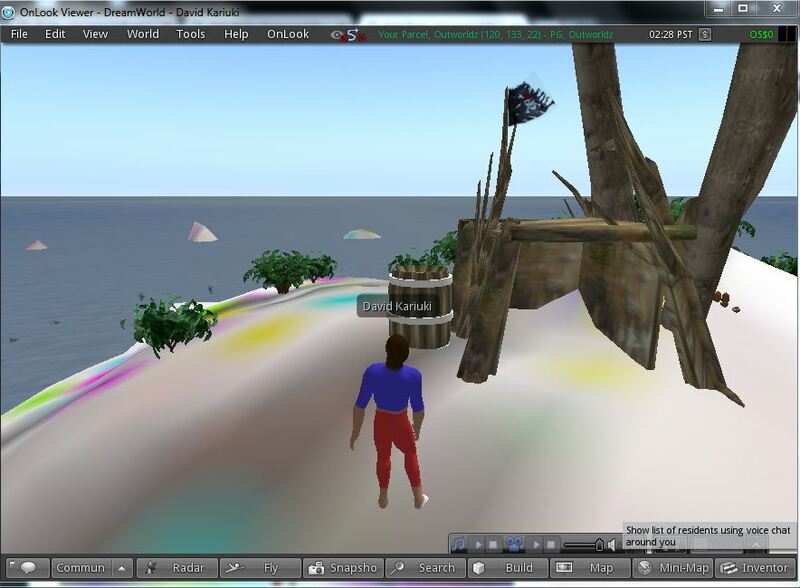 “And maybe even some new virtual world users or businesses that do not want an avatar in their simulation. 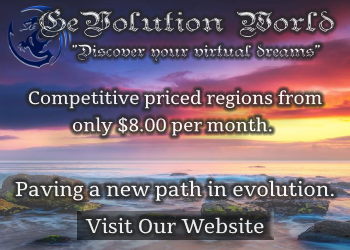 DreamWorld is one of the best and quickest OpenSim installers I have used since it configures routers automatically, has a auto back up, is easy to install with a single click, and is easy to use. 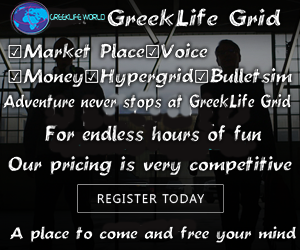 It comes with a lot of ready-to-go content and allows one to easily create and run a mini grid from home or workplace. It is hard for a beginner to comment on this. However, based on the viewers I have used before, I would say installation can be tedious due to compatibility issues. For instance, I would like the installer to recognize when the machine does not have relevant support files and activate automatic installation, which eliminates manual work of downloading graphics files, for example. Is it possible for the software to automatically port forward and set up firewalls? I do not know, but definitely, that would further make the user less worried about what happens if his or her ports are not opened on the firewall and forwarded. Of course, this installer makes things much easier and it would be better working on as many operating systems as possible.